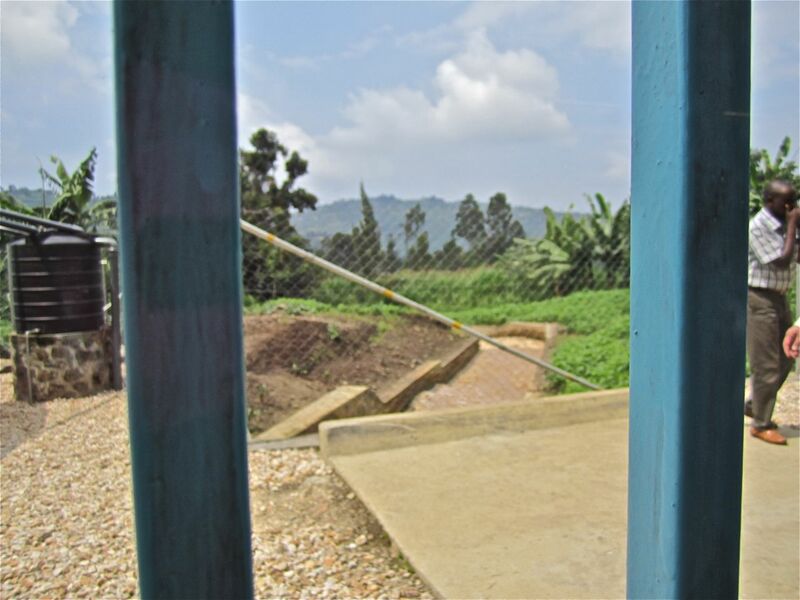 On the second day of our recent trip to the north of Rwanda, we visited a border crossing with the Democratic Republic of Congo (DRC), this one located between the otherwise contiguous cities of Gisenyi (Rwanda) and Goma (DRC). 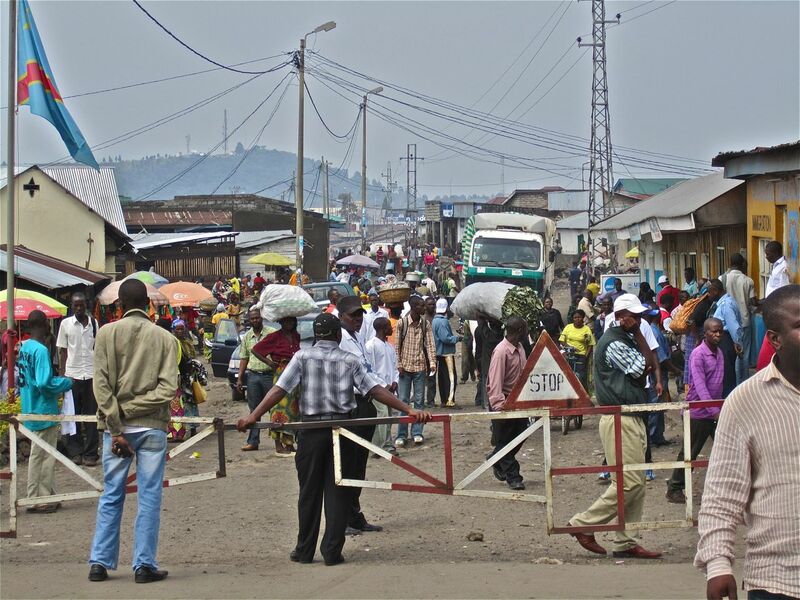 Looking over the barrier to a street in Goma, DRC. We watched a line of people, almost all carrying large parcels of food, waiting to enter eastern Congo. 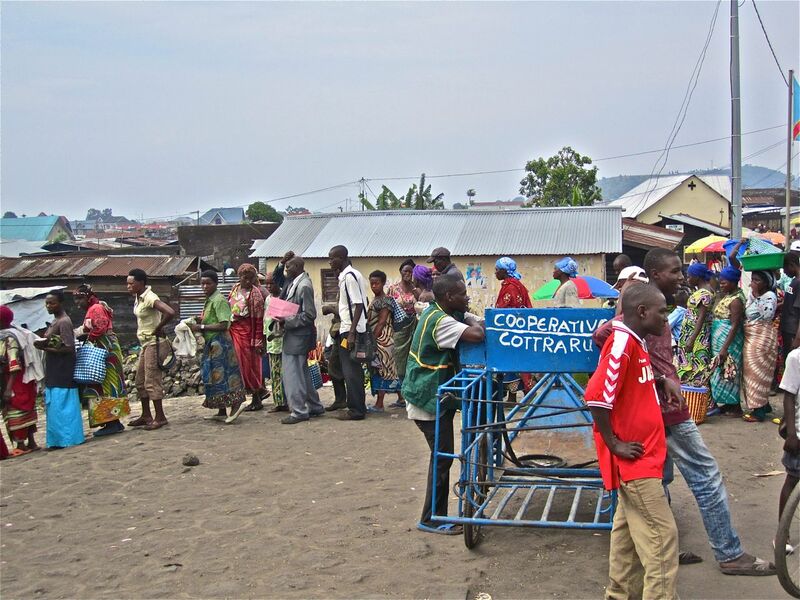 People laden with food to sell in the DRC. 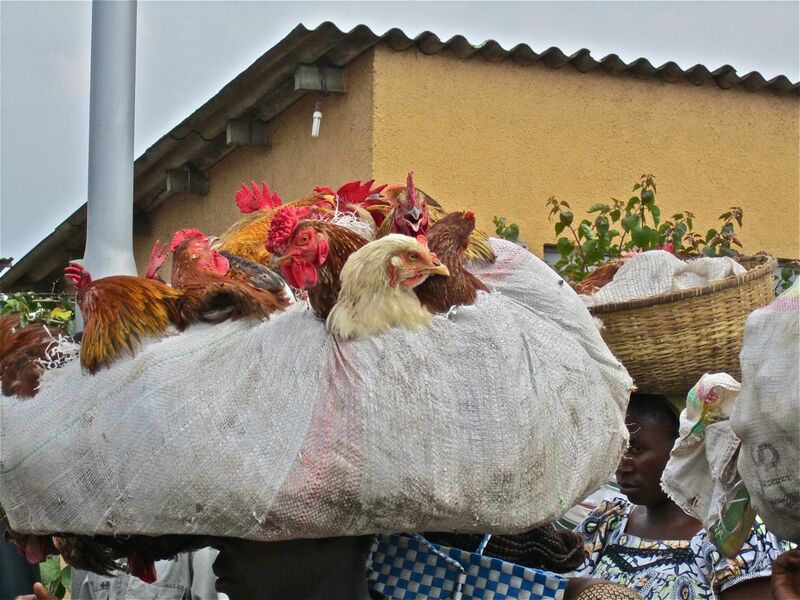 I believe these chickens (who are traveling on someone’s head) would be called non-intending immigrants. Nevertheless, they are destined for pots in the Congo. We watched another line of people, now almost empty-handed, coming back into Rwanda. 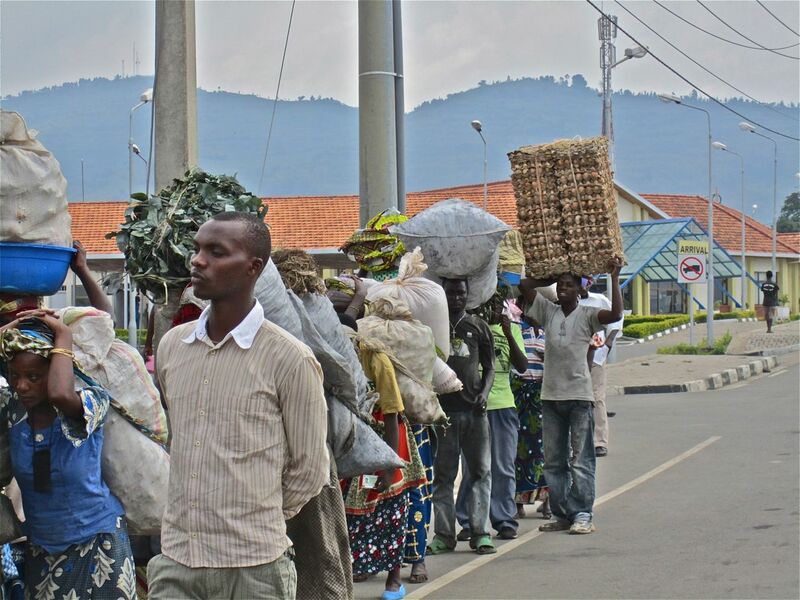 The line to leave the DRC. Afterwards, we headed about 10 miles east to visit a small hydro-electric plant. 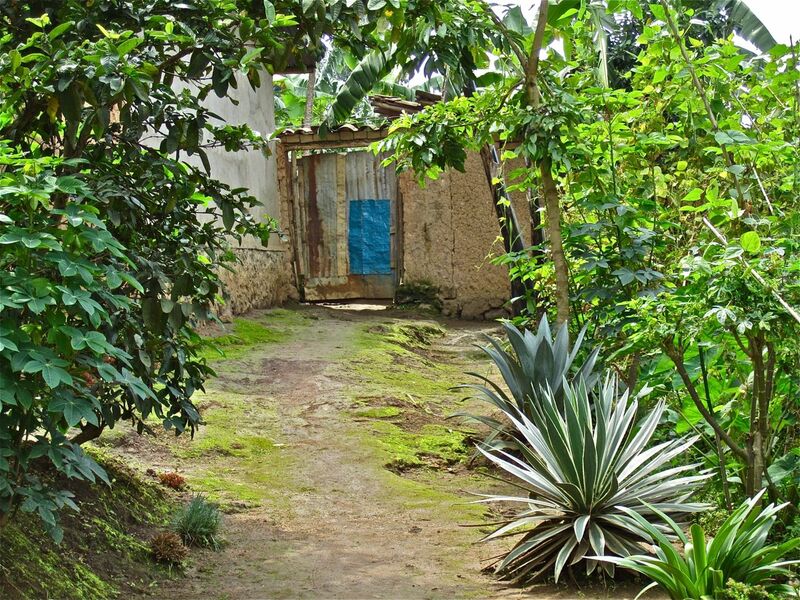 The unpaved road to the plant was too rough for the bus, so we had a walk through the neighboring village. 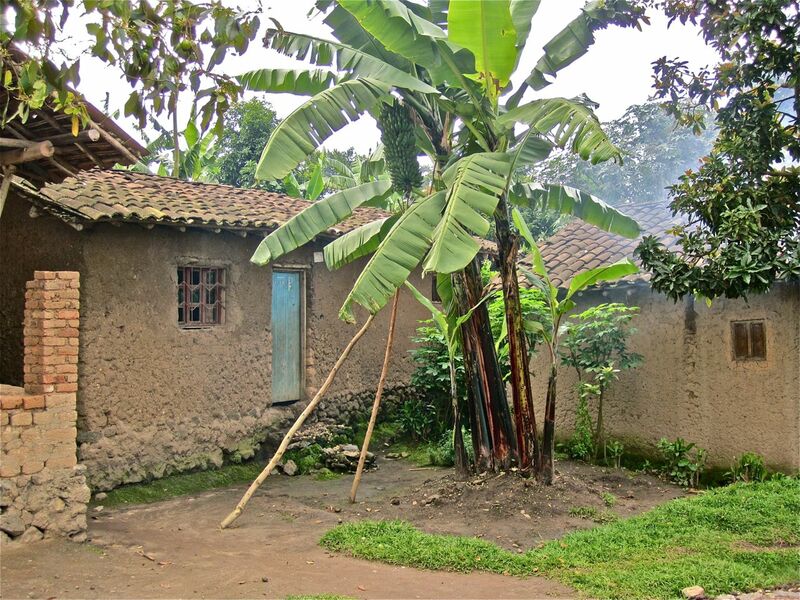 Bananas outside a village house. House door with a blue patch. Cassava (aka manioc) plants and beans grow in the foreground. 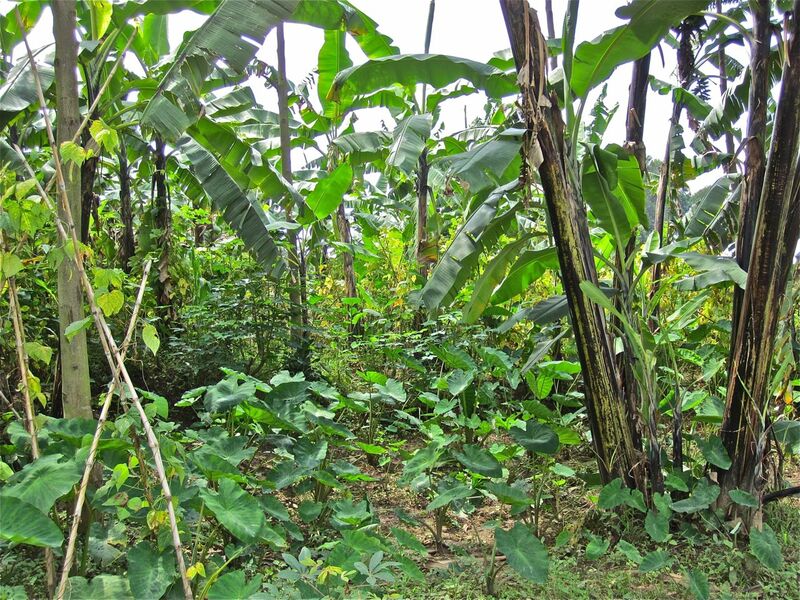 A typical garden of bananas, taro, cassava, and beans. 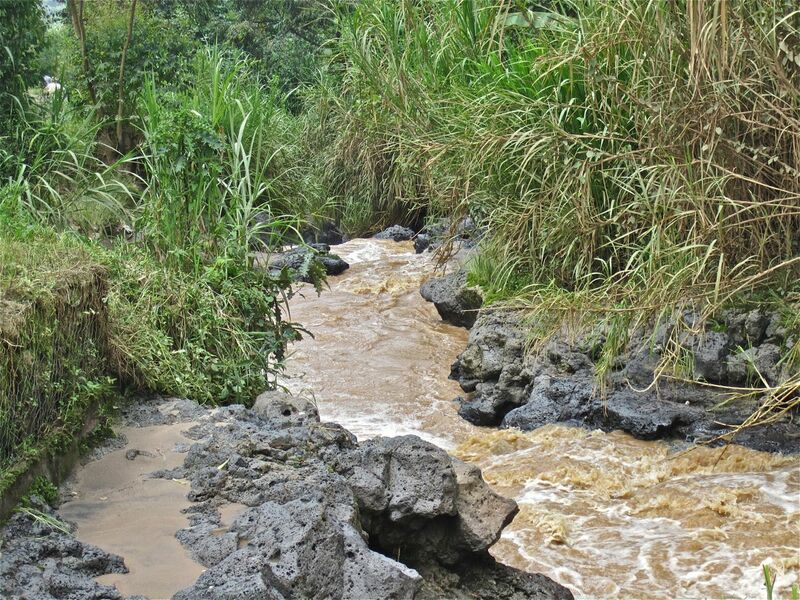 A stream bordered by long-hardened volcanic lava. The fast-moving water runs approximately parallel to the water pipe supplying water to the hydro-electric plant. 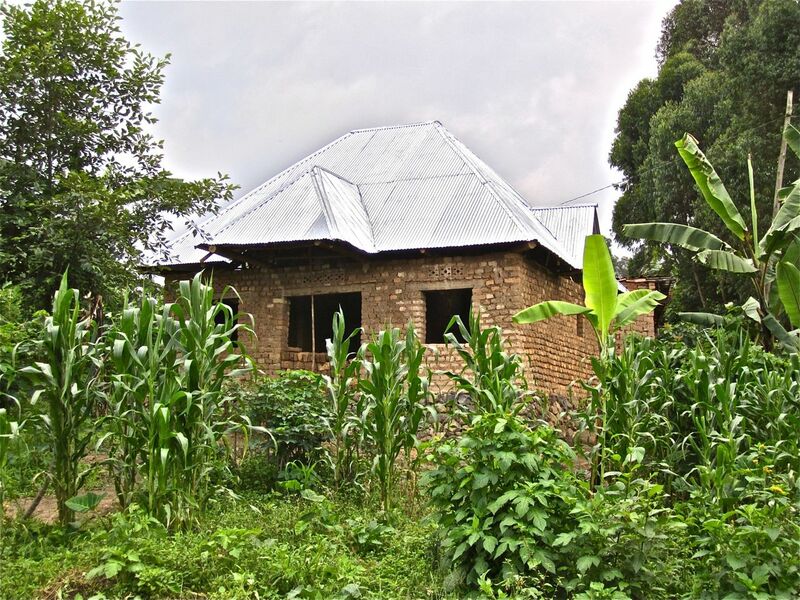 A house under construction with a roof-line typical of the Rubavu District. It seems to echo the surrounding hills and nearby volcanoes. The Keya hydro-electric power plant. The water enters from the blue pipe on the right. 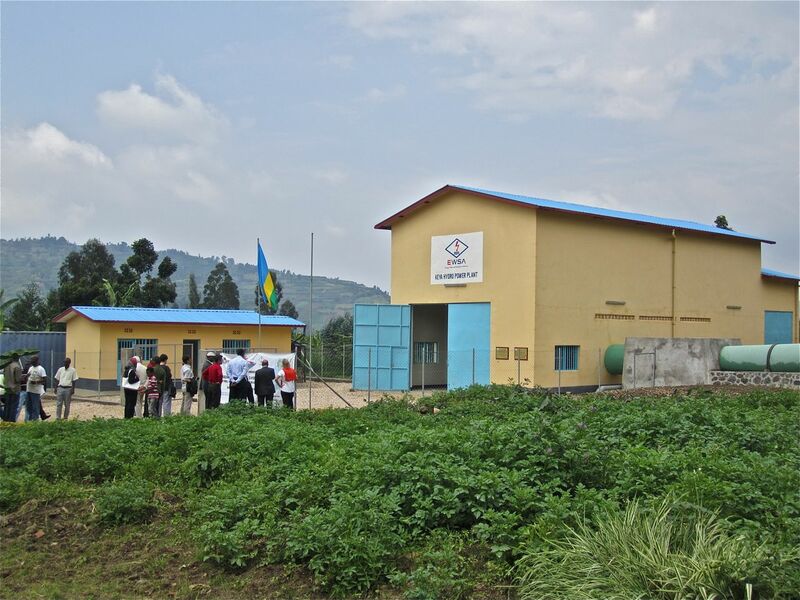 Built by the Rwandan government with the support of Belgium, it provides 2.2 megawatts of power. Water runs out the other side of the plant, beans planted right up to the edge. On the far left is a tank capturing rainwater from the roof of the plant’s office. 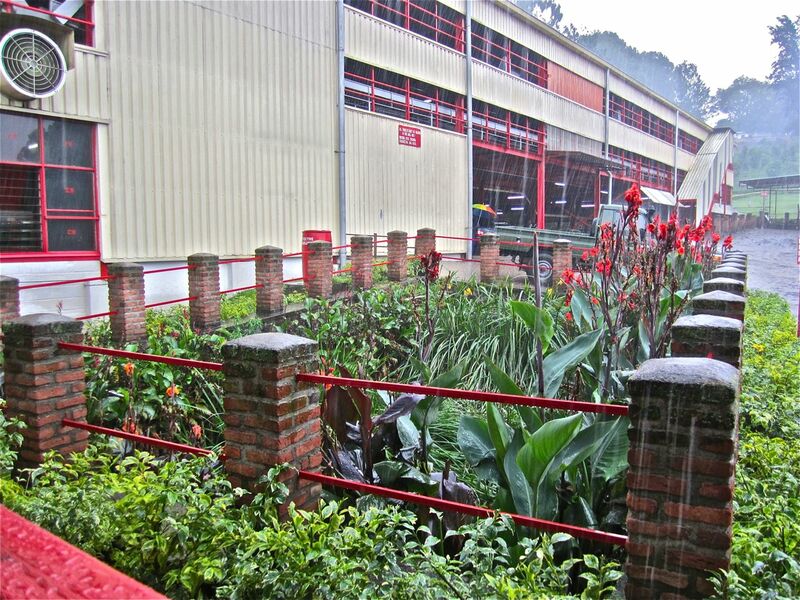 We ended our trip at the Pfunda Tea Company factory. 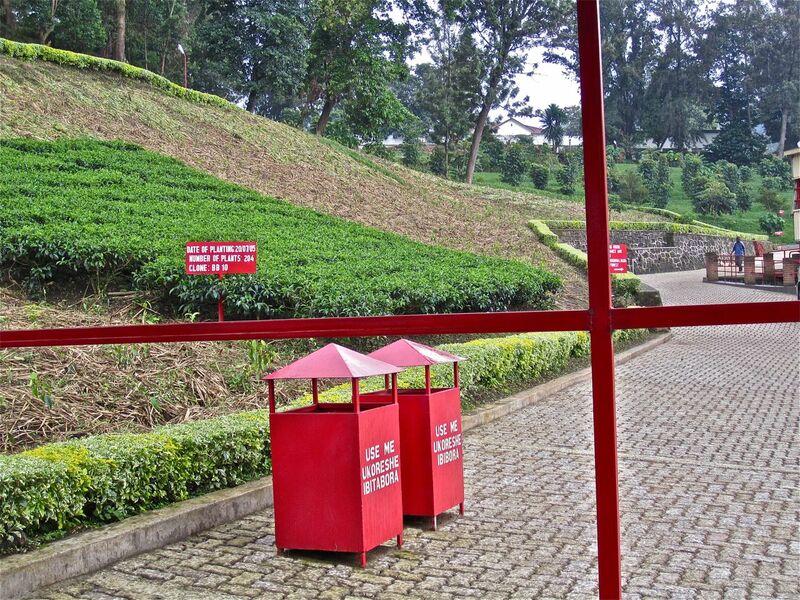 Two thousand people work on the Pfunda Tea Estate, and the company also runs a cooperative for area tea farmers. 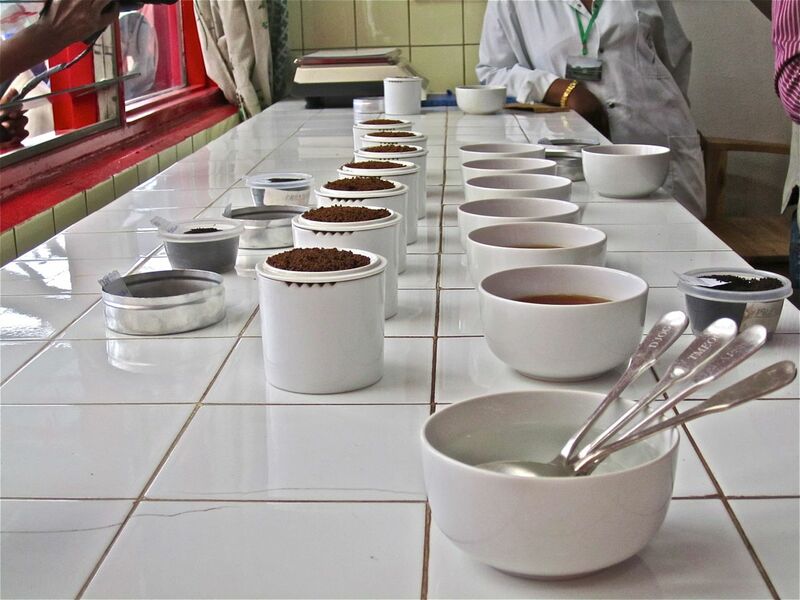 All the tea is raised without pesticides, and, in February 2011, Pfunda Tea Company became the first company in Rwanda to obtain Rainforest Alliance certification. 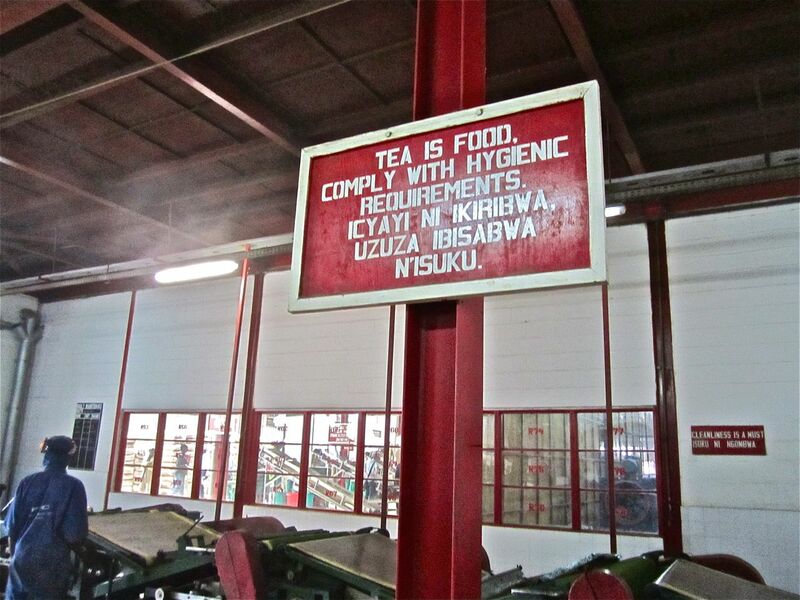 One hundred and fifty people work 8 hours shifts in the tea factory, day and night. 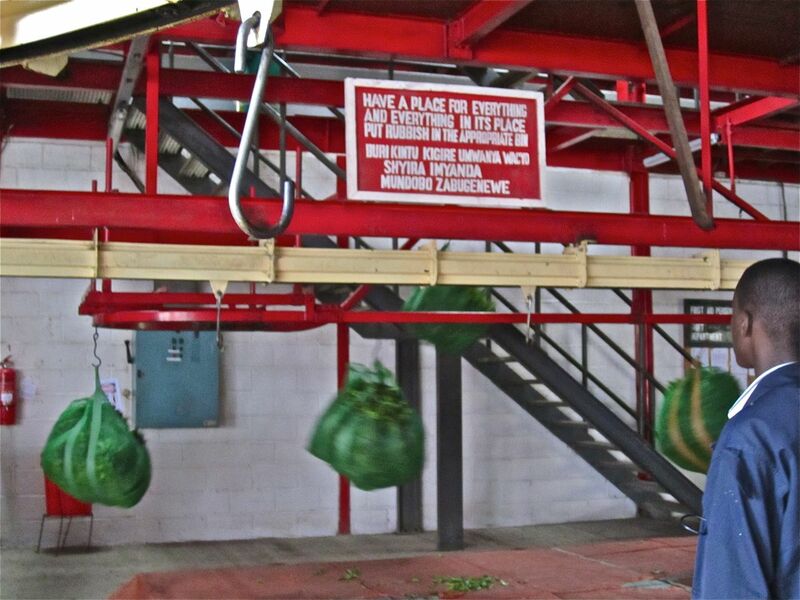 They will produce over 4.4 million lbs. 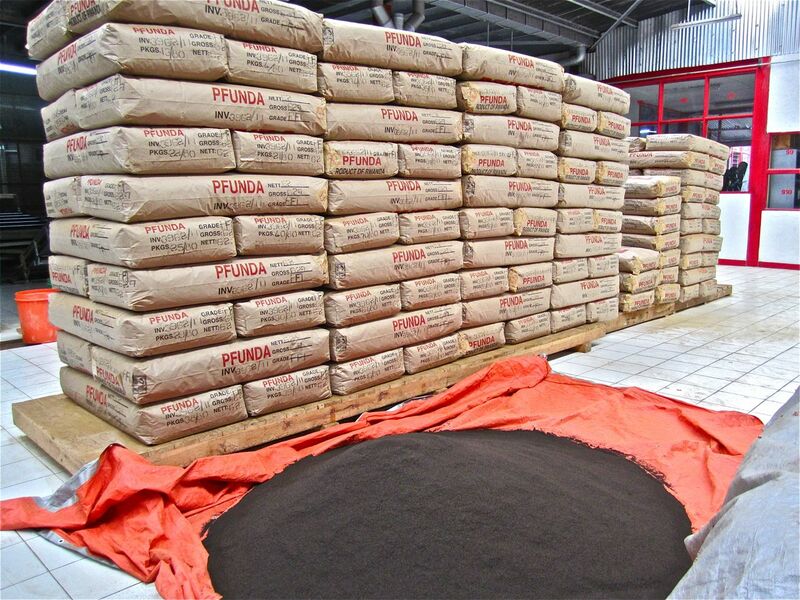 (or 2 million kgs.) of black tea this year. 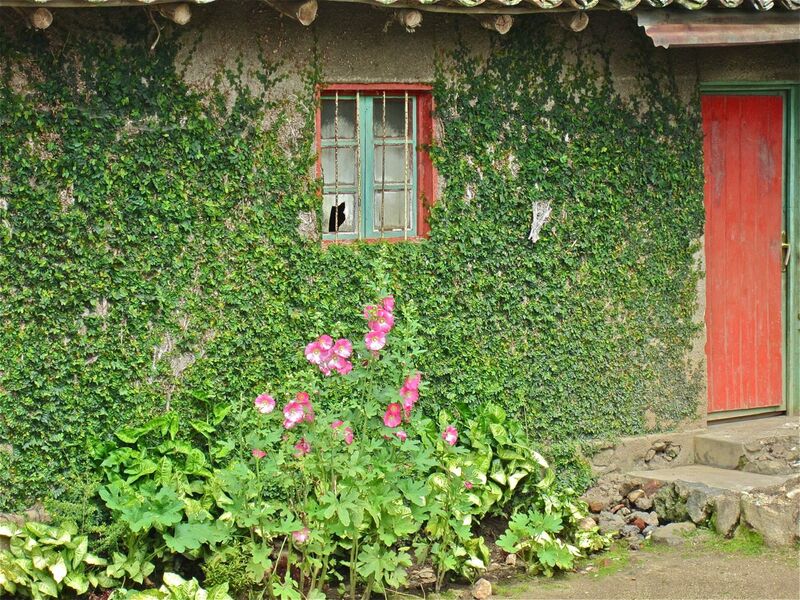 The climate, altitude, and soil of the area is excellent for growing high-quality tea. The design of the factory and its surrounding grounds — even its signage — struck me as remarkably consistent, orderly, and pleasant. Lots of straight, clean lines in red paint and low hedges. A test plot of tea bushes. 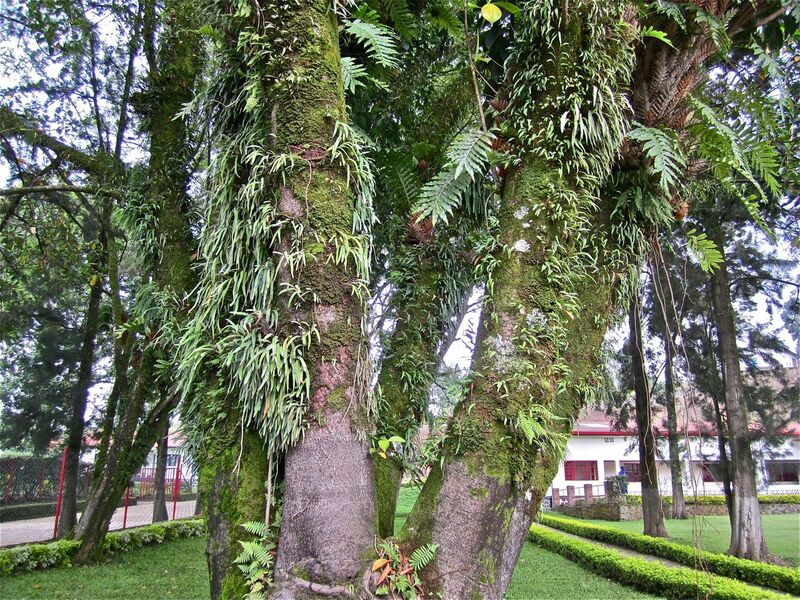 A factory tree laden with moss and ferns. 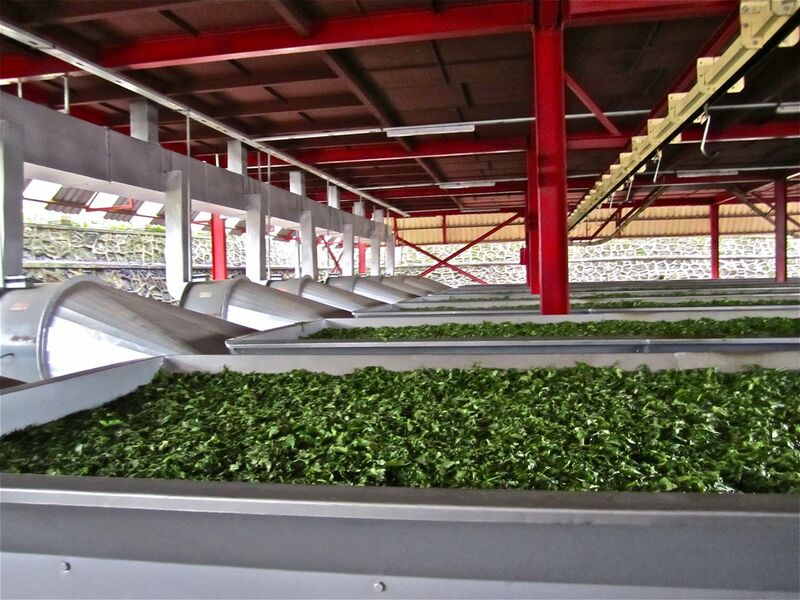 The green tea leaves dry here for approximately 15 hours. 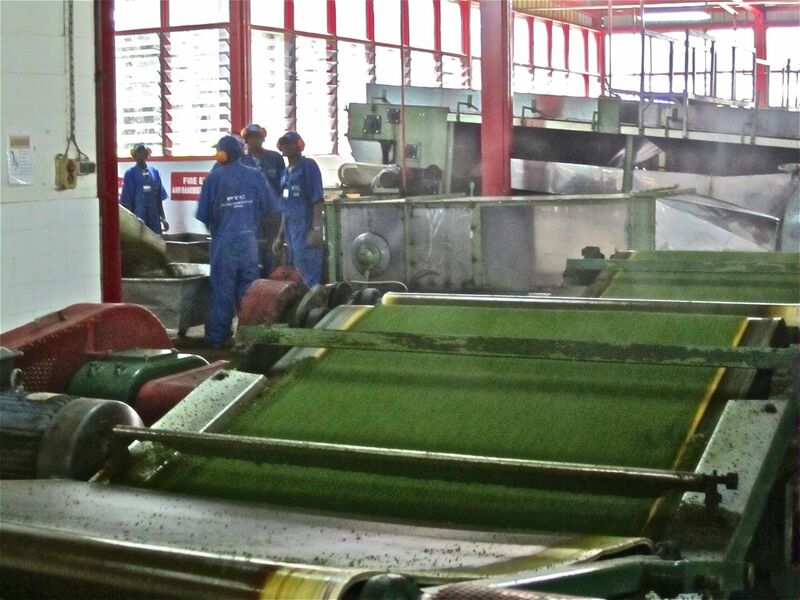 The factory smells like a combination of cut grass and brewed tea. Dried leaves on their way to be processed. The leaves are finely chopped. 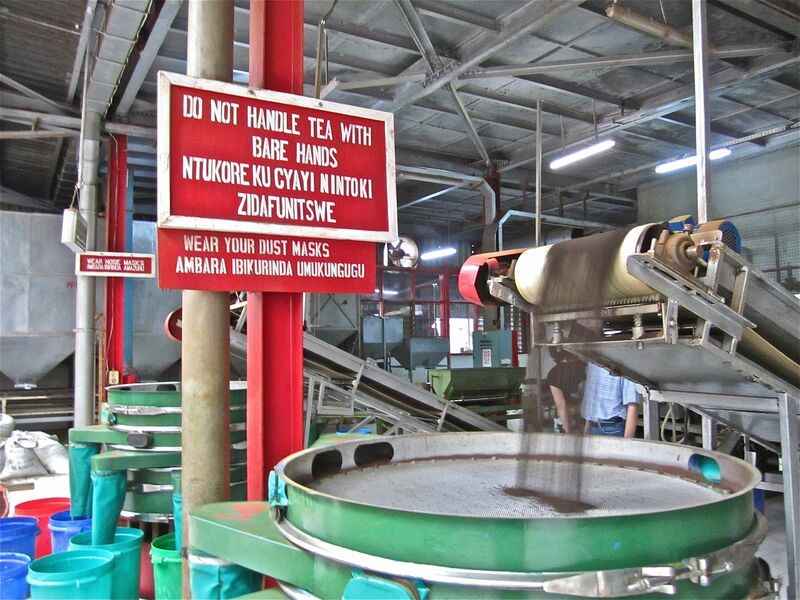 After the oxidation process, the now-black tea rolls off the belt and into buckets. And put in piles before being bagged. The factory is very orderly and clean. A relief to tea drinkers. The testing and tasting room. 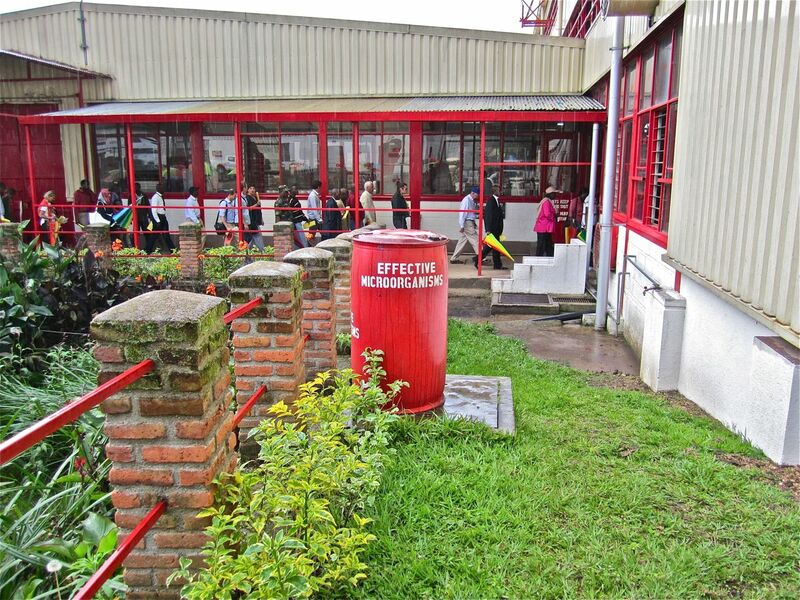 Waste water from the tea processing is diverted to a garden pool and treated with “Effective Microorganisms,” a product that cleans water and eliminates bad odors with a combination of microorganisms that were collected and cultivated naturally. A barrel of Effective Microorganisms. A waste water garden pool in the rain. As we travel, I am always looking for recurrent elements in the landscapes and urban surroundings through which we pass, as well as in the architecture and craft. 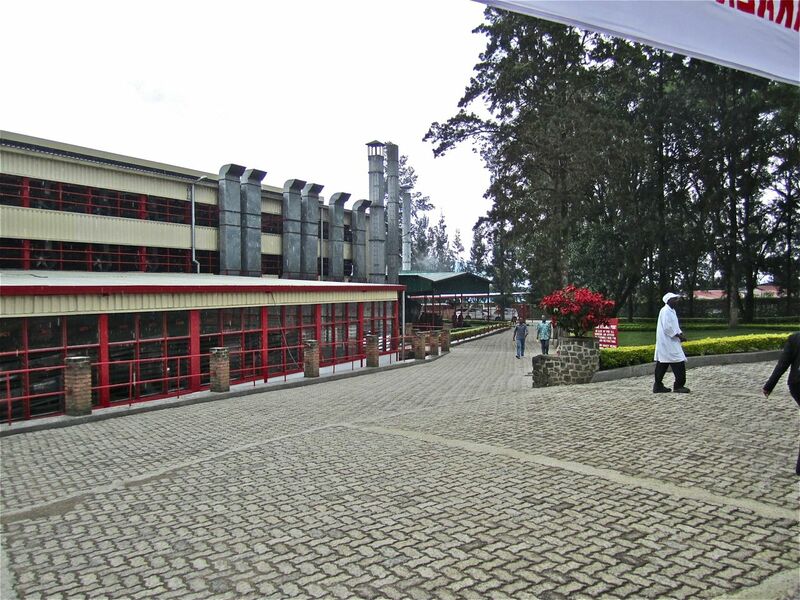 I am trying to grasp what Rwanda really looks like, what it cares about, how it experiences its environment (and how I experience its environment) and how I can interpret at least some of that in a garden design. That last paragraph leaves me looking forward to following your garden next year. I am intrigued. 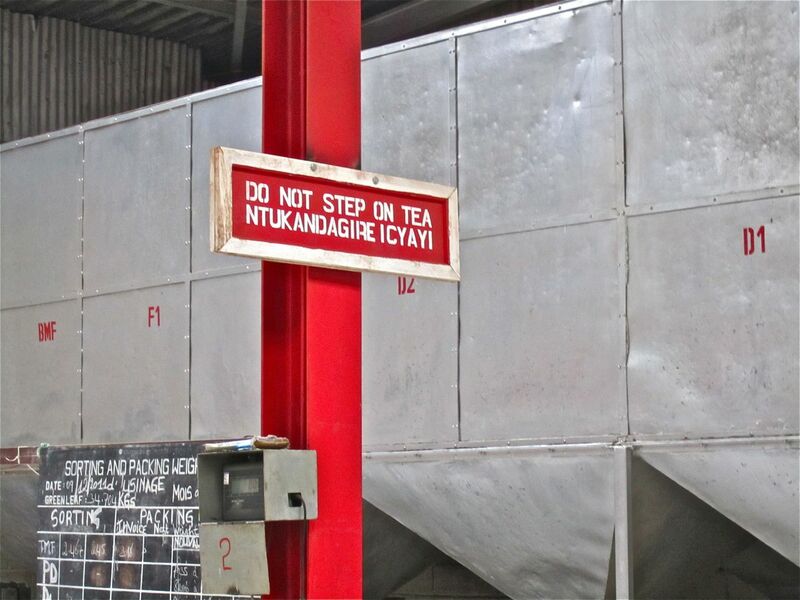 I drink gallons of tea, trying to find any brand grown somewhere in Africa. Comes slowly, with the Fair Trade. Outside of Rwanda, I haven’t yet found a store or brand selling Rwandan tea (marked as such), except for Imporient (which owes Pfunda) in the UK. There, you can order it from their website (click the Pfunda link). If I hear of any other, I’ll let everybody know. Fascinating and eye-opening. Thank you for sharing your part of the world with the rest of us. It’s great to see so much of the new housing with tanks hooked up to the gutters. Not only does it save the water for use, but it alleviates runoff, which is a problem here for walkways and roads.